This is a great time of year to be productive, especially if your Southtown apartments are still feeling the effects of a busy holiday season. Have you not had time to take down your holiday decorations? Is your tree still up? If you answered yes to either of these questions, you’re going to want to read this week’s blog post. The second blog from Southtown Flats is all about apartment-organization. Keeping your apartment organized is one of the most important things you can do to manage your stress levels. If you’ve ever walked into a messy apartment after a difficult day at work, you know exactly what we’re talking about. Sometimes all it takes to relieve stress is a nice, long cleaning session. Below, we’ll talk about some things you can do to keep your apartment organized in 2018. Check out the list, and remember to share this post with your friends and neighbors at your community of South San Antonio apartments! We all do that thing where we come home and throw everything on the counter of the coffee table. You empty your pockets, throw everything down, and forget about it until the next day. You could keep doing that — and keep searching frantically for your keys in the morning — or you could just buy more baskets. Baskets are the perfect catch-all for those things that you use everyday without thinking about it. They also help reduce the amount of random clutter you have around your house, and clutter is the enemy when it comes time to get organized. Storage doesn’t have to take up a ton of floor space, but it doesn’t have to be tucked away in your closet or under your bed either. If you want to find a happy medium, invest in a tall, narrow shelving unit. These taller shelves offer plenty of storage space without taking up too much floor space. Plus, taller pieces draw people’s eyes upwards, and that’s exactly what you want to do to create the illusion of more space. It’s been shown that having a bedtime routine helps people fall asleep faster. If you want to kill two birds with one stone, you can make decluttering your bedtime routine! After you brush your teeth, go around your apartment picking up all the knick-knacks, loose paper and anything else you might have left out. You’ll fall asleep faster and wake up to a clean apartment more often! Get some 3M hooks and put them on the wall. Buy a shoe rack so you have somewhere to put your shoes after taking them off. You might even want to invest in a small end table — and throw a basket on top — so you have a place for your wallet and keys when you get home. Having an entryway can go a long way towards keeping your apartment organized. 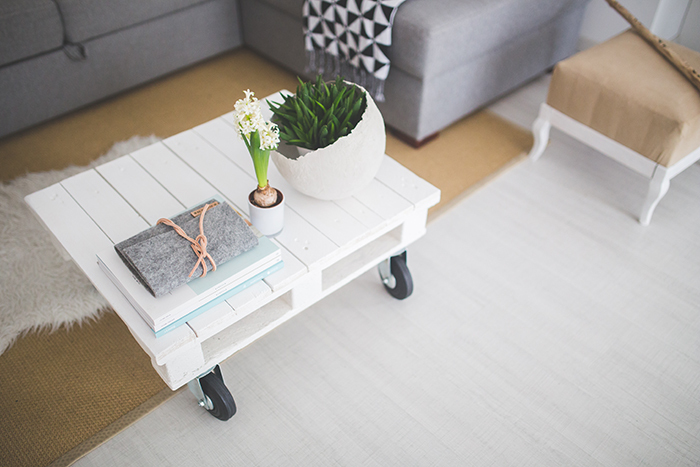 Those are all the apartment organization tips we’ve got for you this week, residents! If you follow the advice laid out in this post, your apartment will be organized in no time! We’d like to take a moment to thank you for taking some time out of your busy schedule to check out the latest post from Southtown Flats! If you enjoyed this week’s post and want to see more like it in the future, remember to check this page again next month when our next blog goes up on the site. Until then, go ahead and follow us on social media! There’s no better way to stay up to date with Southtown Flats — the community of Southtown apartments San Antonio residents choose for luxury living.